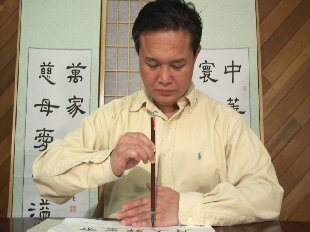 Understanding physiology is important in practicing Chinese calligraphy as well as in other artistic activities. My teacher used to tell me an anecdote that when an English novelist went to see a doctor because of his shoulder pain, the doctor told him that he simply did not know how to write! The Canadian pianist Glenn Gould suffered severely from frozen shoulders by his early fifties. He was the most famous interpreter of Bach of his time. He played a few pieces with stunningly fast tempo quite well. However, he showed a lot of mannerisms at the piano in his posture, movement, and position that might have caused him pain for his arms and fingers. He was in great fear of not being able to play again. He simply did not want to follow the conventional way of sitting at the piano with the appropriate height of arms' level. In terms of musical interpretation, taste, and structure, people in his time seemed to forget Gould’s predecessors like Eugene d’Albert, Ferruccio Busoni, Wilhelm Backhaus, and etc. Some Chinese internal martial artists emphasize both internal and external postures. 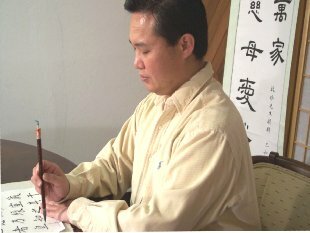 The idea of “internal postures ( 內形 )” can be used to develop more ergonomically correct physiology in practicing Chinese calligraphy in relation to posture, execution, and mind focus. The so-called internal postures are minor or tiny adjustment of angles in certain areas of the body. The adjustment is tiny but the effect in generating strength for martial arts or a calligraphy work can be huge! More articles about postures can be found at http://en.wikipedia.org/wiki/Posture. Stand on one leg for more than 20 seconds in good balance. Keep the same posture but with the eyes closed for more than 20 seconds. Repeat. Keep the same posture with the eyes open for more than 20 seconds. Repeat. Keep the same posture with the eyes closed for more than 20 seconds, but put a thought at the bottom of the standing foot. Add a thought on top of the skull, or any other parts of the body. Feel the different levels of balance. If the tiny muscles of eyelids can create differences, imagine the other parts of the body can create different results to our daily activities. The following is a list of “restated” guidelines for practicing Chinese calligraphy with more details for optimal ergonomics. Please note that no method is absolute and these guidelines only serve as references or self-check points. By adhering to these guidelines combined with some of your experiences or knowledge of practicing meditation, internal martial arts or Qigong, or other methods like Pilates and Alexander Techniques, the practitioner will enter a higher stage of consciousness and self-realization and may enjoy longevity due to better physical and spiritual well-being. The guidelines are not “religions” or “mysticisms.” They simply follow many of the most natural ways our postures can be in practicing Chinese calligraphy. recommended for more advanced levels. Keep head straight. Keep head and neck in a naturally bent curve but not too forward, otherwise the back of the neck will be strained. Observe each stroke through the nose down to the center of chest. Use the nose as an imaginary centerline for separating each Chinese character into left and right spheres but do not stare at the nose, chest or brush tip or anywhere. Relax shoulders. Rest left palm near the center of the torso to stabilize and flatten the paper whether we are resting the right elbow on the desk or hanging the right arm while holding a brush. At this moment, it’s okay to tilt the head a little bit leftward if you are right-handed. This is normal for most people. But be aware that tilting too much (say, more than 10 degrees from the base of our neck) will eventually make our Chinese characters crooked and our spine not in a proper position. Keep torso straight. Sitting on full chair and leaning backward should be avoided. Keep feet on the ground. Never cross legs and feet. Keep legs parallel and relaxed. The legs' postures and positions are as important as those of hands. Once the mind, body, and spirit are coordinated, one may feel energy or heat flowing at Bubble Wells “Yung Chuan Shei 湧泉穴 ” at the bottom of the feet. This will bring the mind to a higher level of awareness and artistic creativity. Mentally imagine (but not physically exert) that the toes are grabbing the ground lightly with the sole of feet hollow. Both heels and knees are forming two lines that are perpendicular to the ground. If our knees and toes are forming lines that are perpendicular to the ground, the energy flow through the knees is less and the ergonomics will be somewhat less optimal. We have to make all necessary postures natural even if they are “unnatural” to us at first. Remember to make both “natural” and “unnatural” natural and our progress will be promising. Keep (not hold) the breath and concentrate during execution of each stroke. Breathing during writing each Chinese calligraphy stroke will interrupt our concentration. Unnecessary talking is a taboo. Then breath naturally between strokes or characters. Do not force breathing. When we reach a higher level, we will realize that like turning brush tips to tiny directions in each stroke, the breath can be controlled to synchronize the turning of brush tips. Hence, the mind, brush motion, and breath (energy) movement inside our body are coordinated in a way that they are working together in the same intention. This is somewhat an imaginary or metaphysical sense since it's in microscopic levels and nuances. Please don’t pretend it. This stage will come naturally and will be self-explaining only after we have practiced long enough. Remember it will come naturally. Do not keep our buttocks outward. Keep torso straight and relax groins. Coordinated movement flows from the center of the body outward. When swimmers kick, they generate power from their hips, not their toes. In piano playing, a pianist goes from the shoulder girdle to the fingertips. In most Chinese martial arts, the forces come from the hips and groins, not from the upper arms. Likewise, the principles are the same in practicing Chinese calligraphy. Review the holding and operation of a brush. Keep tip of the tongue slightly on top of upper teeth. This will help elevate our spirit. Physiology does not only deal with our physical body. It is necessary to keep good moral habits to “mentally” keep our nerve system functioning at the optimal level. It need hardly be emphasized that immorality of any sort will in time undermine the strongest nerve system. It is the surest, quickest, and deadliest enemy of good nerves. A master artist must have fine nerves. An artist’s inspiration depends on his/her functionality of nerves and level of consciousness. Just as machines need maintenance and cleansing, so do our body and mind. Practicing Chinese calligraphy properly with the right attitude and physiology can mentally and physically calm our mind, body, and spirit and lead to longevity.